While both X-FDBK and Primary Source Expander (PSE) help prevent feedback, they do it in very different ways and therefore each of them is meant for different uses. 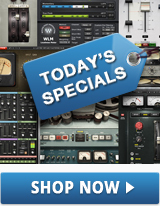 Let's first understand the main differences between how the two plugins operate. X-FDBK identifies the precise frequencies that cause feedback and surgically cuts them. PSE automatically attenuates the gain level between musical phrases in a predetermined amount according to a set threshold. By reducing noise and mic bleed down between phrases, it also reduces sensitivity to feedback. You have a singer who cups the microphone and causes feedback constantly while singing. X-FDBK will cut the offending feedback frequencies at all times, even while the singer is singing. 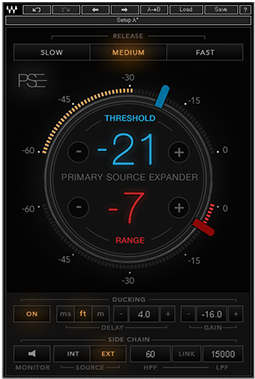 By comparison, PSE will attenuate the gain and help prevent noise and feedback only while the singer is not singing. You have an instrument with long sustain, for example piano. X-FDBK will accommodate the instrument’s natural dynamics, feel and decay time, whereas PSE might cut off the sustain on instruments with long natural decay such as the piano. You have a singer who moves a lot and goes past the PA line. PSE will prevent the PA from feeding back whenever the singer is not singing, by automatically lowering the mic gain between sung phrases. You want to reduce stage noise bleeding through your mics. What if I want to use both plugins together? First use X-FDBK to ring out your monitors and PA. X-FDBK will usually be inserted on your aux when ringing out monitors and on your master buss when ringing out the PA.
Then insert PSE on the relevant channel and adjust the threshold and range in order to reduce stage bleed between phrases in that channel.